Part of farm life for me is cooking, and I absolutely love to try new things. In fact when we built our barndiminium, I wanted to make sure that while we downsized our living space, our kitchen space still had plenty of room to experiment and let this southern girl do what we love to do – cook to show our love for family, friends, and neighbors. I’ll be sharing recipes that I’ve tried and that have made it into our family repetoire of pure yumminess. Instead of creating another page, if you ever want to search the recipes, just click on the Farmtastic Recipes in the categories list. 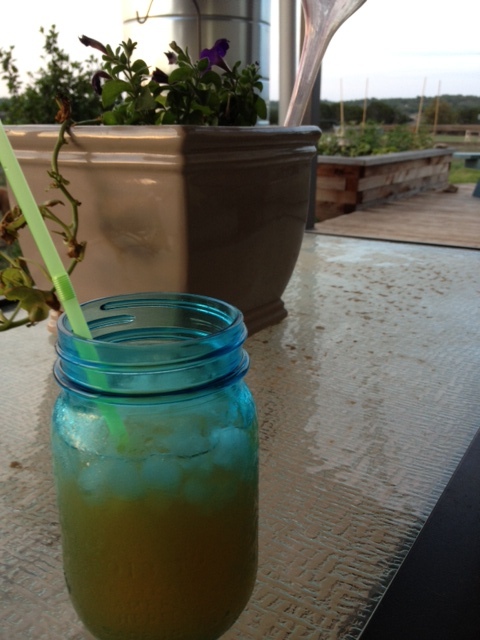 To get us started, the first recipe had to be some delicious sweet tea, perfect for porch sitting. Now, don’t tell me your are shocked because everyone loves a drink on the porch and tea is the elixir of the South. Back in May 2011, Southern Living had a large section of their magazine dedicated to all things sweet tea. Holy moly was I in heaven! I tweaked the recipe a bit based on what I had on hand and have some tips for what makes it work. I prepared this just like the recipe, except I swapped out apple juice for pineapple juice, as it is what I had on hand. Delicious! Crushed ice really makes this special, so don’t go with the big cubes. This is sweet. Honestly, I think you could cut back on the sugar a scooch, and it would be just as tasty. It says to let it chill for at least one hour. Well this farmgirl, just couldn’t wait to taste this concoction. So, I filled a large mason jar to the brim with ice and poured it over. Divine! It’s been a busy vet week here at the farm, and our four-legged children are keeping us hopping. First, we took Maybelle in for the usual round of shots. Blessedly, that was uneventful, other than the fact that Maybelle loves to get in the car but starts to spin like a maniac when you try to get her out of the car. Go figure. And since Goober is Maybelle’s best pal, we took him along for the journey. Two are better than one, plus Goober had some odd little growths we wanted the vet to double check. Well as it turned out, the spots all needed to be removed and the vet was concerned it was the dreaded C word, aka cancer. So like good parents, we scheduled him right away and had those puppies removed. We need to keep our Goobs happy and healthy. Which leads me to my sleep deprivation, as I’m sure moms of two- and four-leggeds can relate. Goober was in and out of the vet in one day, and was super happy to be back amongst his pals. However, he’s got stitches in multiple places, but mostly on his undercarriage, hence it’s not so comfy to lay down. Well we thought he had himself settled for the evening, and so we tucked the farm in for a good night’s rest. Not so fast. At 11 p.m. I awoke to hear Goober moaning. Just sad little sighs and moans, as if to say, “Mom, I don’t really feel so great.” Not helping the matter was that he was wearing a standard issue cone of annoyance in order to keep him from licking away on his fresh wounds. At first, I thought he was just stuck, as he had his cone wedged under our bed. (Yes, he really did.) But not so. He just felt badly. 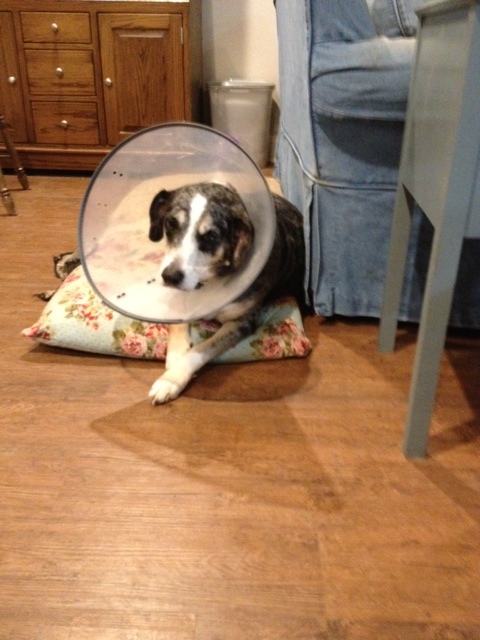 Goober rocking out the cone. None to thrilled, but reaching the point of acceptance. I was stuck in that spot between heartbreak and begging for just five minutes of sleep. Finally sometime between 4 a.m. and 5 a.m. he gave it up and finally tuckered out with my hand on his head. (But not before one of the feline kiddos also decided to upchuck on the floor. Really???? ) Let me just say thank goodness for comfy sofas, tough stain-proof floors, and antibacterial wipes. I am happy to report, we got some good meds at the vet today and Goober is wagging and feeling much better. He’s also become proficient in carrying around his cone. Yes, he still runs into the door frame, but is figuring out how to wiggle around to make it work. I love my four-leggeds, but this farm mama needs some shut eye. Here’s to hoping Goobs is up for it too. Putting meds in a cheese snack now, just in case. P.S. – Please keep Goober in your thoughts and prayers. We’re hoping for a good report. So I think it’s safe to declare that spring has sprung around the farm. (Oh Lord, please don’t fail me now.) And let me just say after this winter with the ice and freezing temperatures, me, Cowboy, and all of the critters are singing a glory hallelujah to that. One of the best indicators that spring has arrived is our annual welcoming of the hummingbirds. They arrive at the end of March and drink generously from our feeders until October. It’s the time of year when sugar is on our grocery list every week. The local checkout clerks must think I am a baking fool. With the arrival of the hummingbirds also comes one of our challenges. Hummingbirds in the barn. Inevitably, one, or heaven forbid two, will flutter in. The problem, as Cowboy has discovered with much research, is that when they panic they fly up. Which is precisely where they cannot get out of the barn. This results in numerous antics, as we move equipment and other stuff out of the way to make a clear path and hang a feeder right outside the door. You can imagine how this thrills Cowboy, but let me assure you he is out there trying just as hard to save the little buggers as I am. And if we can’t get the little guys to leave on there own, they will eventually run out of steam and gracefully flutter to the ground. The challenge then becomes do we see it before Nightmare the barn cat. I’m sad to say he’s beat us to it a couple of times in the past, and proudly presented us with his latest find. Not fun, not fun at all. But tonight was a great night for the first hummingbird-in-the-barn of the season. Cowboy and I cleared out the barn, hung the feeder, and sat and waited. We watched as he flitted from light fixture to light fixture and then finally wore his little self out. We sprinted to action, and I quickly scooped him up, much to Nightmare’s displeasure. Tiny hummingbird regaining his strength at the feeder after he wore himself out flying around the barn. The little guy gets his strength back and can hold on, just before he flies away. It’s an amazing experience to hold one of these tiny creatures in your hands. I took him outside to the feeder and gently pushed his little beak into the feeder, then watched as he drank and drank. He finally started to get his strength and gripped his tiny toes around the perch, and I could feel his body warm up. And then it happened. He sat there, turned and looked at us as if to say, “Thanks dear friends. Much obliged.” (In my mind they have very good manners.) And then flew off to meet his other hummingbird pals whizzing and whirring around the variety of feeders. Cowboy and I smile at these moments because in some small way, you feel like you made a difference. May you all get your chance to feel the wonder of the hummingbird this spring. P.S. You know your man is a gentle soul when you see him on ladders waving brooms and such in an effort to shepherd a hummingbird to safety. Truly blessed here at the farm.